This question must be in the heads of a number of young newly weds as they celebrate their wedding vows on the island of Santorini. For the moment though they look perfectly happy dressed in their wedding finery as the sun sets on possibly one of the finest views in the Mediterranean. And why should they not look happy? We certainly were as we enjoyed the same sunset on our four day break to this charming island. Santorini is a beautiful island set in the Cyclades Islands west of Rhodes and north of Crete. Around 3500 years ago a violent eruption in the Eastern Mediterranean forced the top off a single island to create a caldera 5 km across filled with water. The remains of the crest of the caldera form the main island of Santorini and the islands that lay to the west. 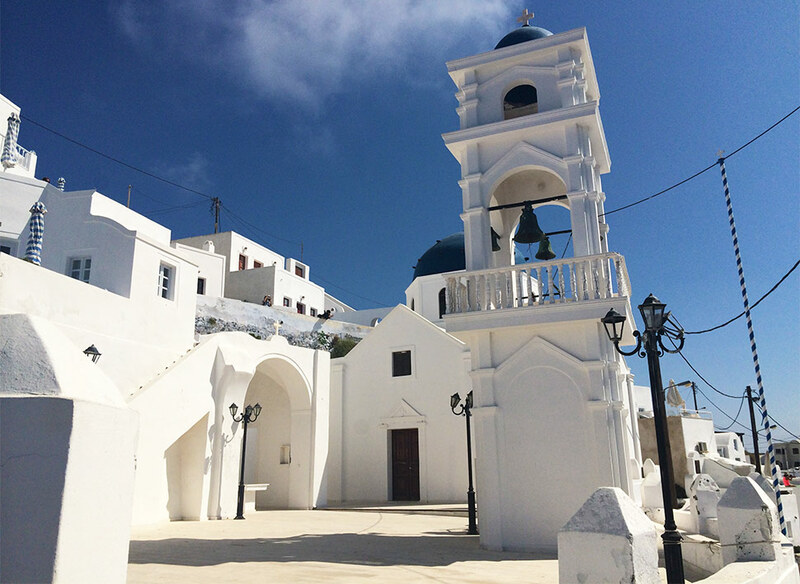 The island has had a number of names, including its official name Thira, but it is the one given to it by the Venetians that has remained until today. 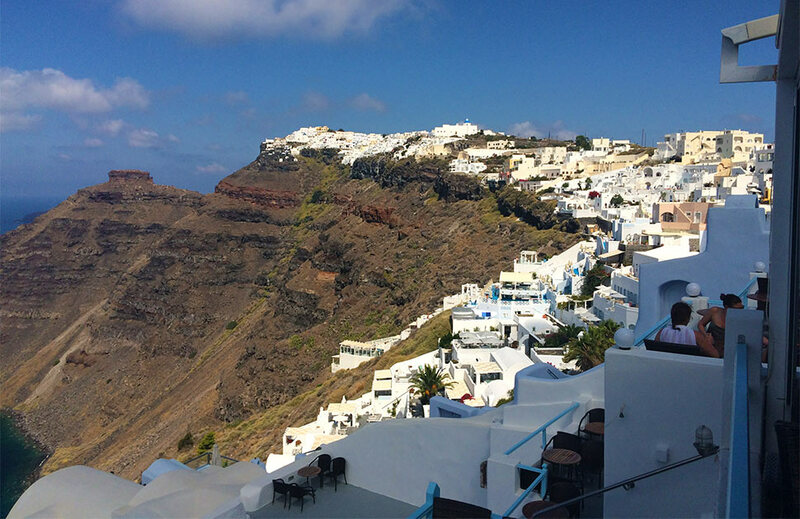 We stayed at the Galaxy Suites in Imerovigli which is at the highest point of the Caldera and looks out across the crater to the Aegean sea, the island of Thirassa and the reforming volcano peak that bubbles beneath the blue waters. The Galaxy Suites are a fantastic place to stay with each of the rooms facing the sea, with fine accommodation including your own plunge pool and patio from where you can enjoy the breakfast which is delivered to your room each morning. The hotel is perfect with commanding views from the bar and the two swimming pools. The staff are charming and nothing is too much trouble to ensure their guests have a great holiday. 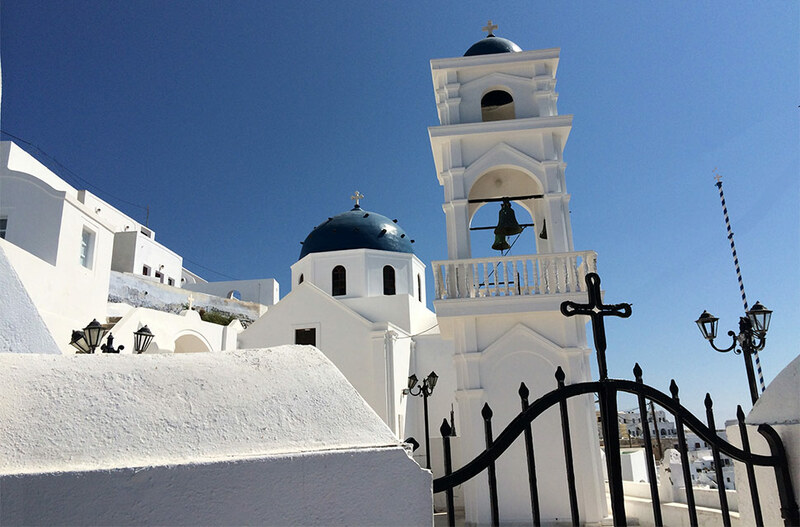 From Imerovigli you can walk to Fira the capital of the Island along the ancient stepped path and take in the beautiful blue topped churches that cling to the crest of the volcano with the sea lapping many hundreds of feet below. If you walk in the morning you can enjoy a shaded stroll as the sun is still in the east just a few hundred yards on the other side of the volcano ridge. The road winds through the houses and small hotels and bars can be found at Firostefani to enjoy a cooling drink whilst you top up on those photo opportunities. Santorini is a place for cruise stopovers to take in the magnificent vista the island offers. These prompt you to take to the sea to join in the view. Santorini Sail based at Oia is a first class operation. They were recommended by the hotel and we were not disappointed. You can join catamaran tours at the port of Oia but we were glad that we signed up for the 51 foot monohull cruising yacht. Captain Cosmas has over 25 year’s sailing experience and it shows as he pulls the yacht alongside the quay for you to join the voyage. Cosmas takes you around the island to magnificent coves and caves and an opportunity to swim in the very warm waters of the volcano. He and the team produce a great lunch and if you are prepared to trade swim stops he will let you handle the yacht under full sail an unforgettable experience. As an alternative you can visit the ancient sites at Akrotiri and Thira, perhaps remains of the lost city of Atlantis, or take in the beaches at Kamari or Perissa. There are an abundance of restaurants all with great views in Fira and a great lunch can be enjoyed most anywhere. In the evenings we would walk along the caldera ridge and watch the sun going down before enjoying a cocktail and watching the parade of wedding dresses trying to guess which was worn by a real bride and which a fashion model. Imerovigli, quieter than Fira, also boasts some fine restaurants with La Maison, Mezzo and Avocado looking out across the caldera but possibly the best for food and service is Anogi in the small town square. Santorini is a place of real charm and relaxation with some of the finest views you will see in the world. A geographical masterpiece, a cradle of civilisation and a fine destination for romance. As you board the plane home and ask yourself will you still love Santorini tomorrow, the answer is a resounding yes!